1.Close all doors, engine hood and tailgate. 3.All doors and tailgate will lock. The hazard warning lights will blink once. 4.If the lock button is pressed once more within 4 seconds, the hazard warning lights will blink and the horn will sound once. 5.Make sure that doors are locked by checking the door lock button inside or pulling the outside door handle. 2.The driver's door will unlock. The hazard warning lights will blink two times. 3.Press the unlock button(2) once more within 4 seconds. 4.All doors and tailgate will unlock. The hazard warning lights will blink two times. Press the lock button(1) and unlock button(2) at the same time for 5 seconds or more. The hazard warning lights will blink four times. The horn sounds and the hazard warning lights blink for about 30 seconds if this button is pressed for more than 2 seconds. To stop the horn and lights, press any button on the transmitter. 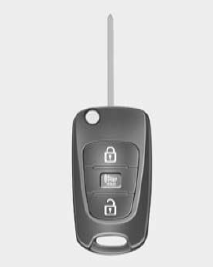 If the keyless entry system is inoperative due to exposure to water or liquids, it will not be covered by your manufacturer's vehicle warranty.